What is Azee (Azithromycin) used for? 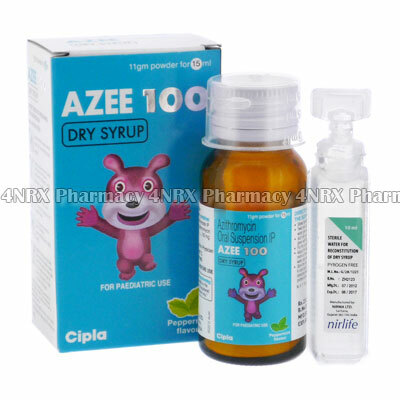 Azee (Azithromycin) is a macrolide antibiotic prescribed for pediatric use. It is typically used for the treatment of skin infections, ear infections, or respiratory tract infections. The medication operates by preventing the existing bacteria from reproducing and allowing the body to fight the infection naturally. Note that it will not be effective for the treatment of fungus or viral infections such as influenza. How should I use Azee (Azithromycin)? Always follow your pediatrician`s instructions for using Azee (Azithromycin) to get the safest and most effective results from treatment. The correct dosage will be determined by your doctor based on the patient`s age, weight, current health, the condition being treated, and the severity of your symptoms. These should be measured using the included measuring cup and administered orally. Do not stop taking the medication before being instructed to by your doctor, even if the symptoms seem to be gone, as the infection may return stronger or more resistant to treatment. Ask your pharmacist or doctor any questions you have about the medicine to ensure the correct usage. What are the side effects of Azee (Azithromycin)? Serious side effects possibly requiring emergency medical attention are irregular heartbeats, chest pain, difficulty breathing, intense diarrhoea that is bloody or watery, intense stomach pain, darkened urine, discoloured stools, jaundice, or severe skin reactions. Inform your doctor as soon as you experience any worrying or intense symptoms to make sure the necessary adjustments are made to your dosage or application frequency to prevent further health problems from occurring. Azee (Azithromycin) should not be administered to patients who are children under six months old, children weighing under 45kg, lactose intolerant, who are allergic to macrolide antibiotics, or who have a bad reaction to similar treatments in the past. Also inform your doctor if you have diabetes, arrhythmias, an abnormal heart rhythm, bradycardia, reduced electrolyte levels, myasthenia gravis, liver disease, or severely reduced kidney function. These conditions may cause unexpected health problems requiring special adjustments to your regimen to prevent further health problems from occurring. Strictly use Azee (Azithromycin) as prescribed and follow all instructions provided by your doctor. Safe, suitable, and optimum dosage can vary and is dependent on the patient`s health and medical history, as well as the condition you are treating. Azee (Azithromycin) may not be safe or suitable for all patients. Always ensure your doctor is informed if you are pregnant or breastfeeding, using any other type of medication (including non-prescription medicine, vitamins, and supplements), as well as if you have any allergies, other illnesses, or pre-existing medication conditions.